Newly renovated and expanded 1959 Mid-Century modern home. 6 bedrooms, 6 baths, huge open plan living/dining/kitchen, pool/spa, outdoor kitchen and more! Over 5,500 sq. ft. of combined indoor/outdoor living space. This luxurious, mid-century modern Alexander home was originally designed by famed architect William Krisel and is one of the largest Mid-Century homes of its kind in the Racquet Club Estates enclave. Per new Palm Springs Vacation rentals laws, the maximum overnight guests allowed are 12 Adults + 2 kids under 12 years. An additional 4 daytime guests are allowed between 10am-10pm. 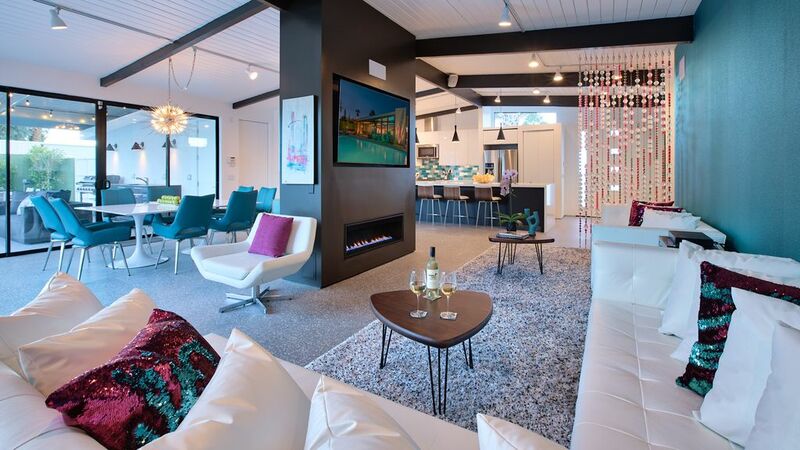 This expanded Mid-Century home honors the architectural integrity of the original Mid-Century design while providing a huge, modern, open-concept great room that combines kitchen, dining and living areas, perfect for the warmth and intimacy for small groups and spacious enough for large groups. There's no limits on entertaining with three kitchens, including four sinks, three dishwashers, two refrigerators, KitchenAid 5 burner gas range, convection wall oven, microwave and a well-appointed complement of small appliances, cookware and large serving pieces. You'll love the 14-foot island/bar, with plenty of room to cook, serve cocktails or create a buffet line with adjacent table seating for up to 12 people both inside or 12 people outside. 6 generously sized bedrooms, each with its own en-suite bathroom means no one has to share a bathroom. 3 feature king-size beds, 3 have queen size beds and all have fresh and clean marble tiled bathrooms; 2 with bathtubs, 4 with barrier free walk-in showers. Comfortable mattresses and all cotton bedding makes for a great night’s sleep in each bedroom. The private outdoor spaces includes an outdoor living and dining areas, outdoor kitchen and gas grill, five private patios, chaise lounges, fire-pit and enough seating for everyone. Splash in the salt-water pool with tanning shelf and a tiled 6-person spa. The outdoor shaded living room includes comfortable sofas, so sit back and enjoy! This is a green home powered by a whopping 21kw of solar power, 12 tons of super efficient heating/air, state-of-the-art LED lighting throughout. The updated media and internet technology includes 7 Smart LED TVs and Cable TV service in the great room and in all bedrooms, USB charging ports throughout the home, LED 70-inch main Smart TV, Netflix, etc., 5.1 home theater audio system and super high-speed internet with full coverage throughout the property. This designer home is the perfect place to enjoy the company of friends or simply get away from it all. Either way, we welcome you to experience all the wonderful things this fun, elegant home has to offer. House is not child proof; the pool is not separated from the house, may not be suitable for small children. Rates do not include $395.00 cleaning fee, optional pool heat $69/day, $500 refundable damage/noise deposit, $99 PDP and 11.5% Palm Springs City tax. This home is a true Mid-Century Modern home built in 1959, located in the historic Racquet Club Estate enclave. Built by the Alexander Construction company and designed by renown architects of Palmer and Krisel, the homes is set on a beautiful lot in the historic Racquet Club Estates enclave. It doesn't get much more perfect for a Mid-Century aficionado than this! toilet, tub, shower, Marble tile, Grohe fixtures, large space! toilet, shower, Marble tile, Grohe fixtures, large space! toilet, combination tub/shower, Marble tile, Grohe fixtures, large space! All brand new fully renovated bathrooms. Marble tile shower and walls, terrazzo tile flooring. Large enough for two people to get ready at the same time. Main living areas and all bedrooms have their own individual A/C units. Main living areas and all bedrooms have their own individual HVAC units. High speed WiFi with repeaters throughout the house and outdoor. You'll always have WiFi anywhere on the property! HUGE great room, open concept! KitchenAid 5-Burner gas range with dual ovens. Kitchenaid Wall oven plus a 5-Burner gas range with dual ovens. 3 total ovens and 5 burners! Dishes and utensils for two meals, you'll never run out! Huge gourmet chef's kitchen with all the amenities! We love to cook and it shows! Dining area overlooks pool, seats up to 12 with a gorgeous Mid-Century sputnik chandelier. Private patios on 5 bedrooms, plus master facing directly onto pool area. What a great home; perfectly and beautifully designed for entertainment and privacy! Can't say enough good about the kitchen, so well equipped; we loved cooking here (there was even shape knives and an extra refrigerator!) The pool and SPA was over-the-top cool so was the outdoor, covered dining area. Since the house is located in a historic mid-century modern area, it made for great walks (with our dog!) Keith, one of the owners, was really responsive to your needs… we will be back! Hosts were wonderful and very accommodating. The place is very clean and well laid out for a large group gathering. The kitchen has all the appliances and tools necessary for a great stay. This was our first visit to Palm Springs and we could not have picked a more perfect house. It was well located and had an incredibly well stocked kitchen, there was not one thing we needed to make a meal that was not to be found in the kitchen. And the locations of all those items were even labeled on the cabinets. We had our extended family at the house, 7 of us, and the house was great given that each bedroom had its own private bath. We have rented homes on VRBO around the world and this is definitely one of the best we have ever been in.